Home » Health & Wellness » Zip-a-dee Doo Dah! You may have previously stopped by and noticed I was walking around with a Striiv Play. Well, I eventually got tired of the issues I was having and returned it, opting to continue on with my pursuit of fitness using my Fitbit Classic. I then stumbled upon a deal too good to resist, and wound up picking up a Fitbit Zip. My previous post went into a fair bit of detail with regards to the fitbit classic, so this one will focus on the Zip. As you may have noticed from the first photo, the zip is not that much different in size from the classic. It can be work inside a silicone clip – or it can be carried on its own. Outside of the clip, the Zip is smooth and pebble-like – not much bigger than a quarter and a bit slimmer in profile than the original fitbit (less than 1/2-inch in thickness). The clip allows for more versatile and secure storage/wearing, though because it is all silicone-ized, it’s a bit grabby and definitely a magnet for lint and dust bits. The few times I’ve found myself without pockets, I clipped the zip to my waistband – but I found that the grabbiness of the clip required some work to make sure the zip was seated securely and correctly in place. Performance-wise the Zip acts pretty much as a straight-up pedometer. It will report steps taken (though not stairs/elevation), total distance, calories burned, time and perceived activity level. The Zip runs on a replaceable 3V coin battery (CR2025), and synchs wirelessly with either my computer or my phone (iphone – requires the fitbit app). 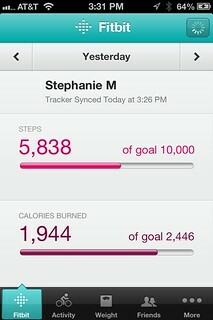 Activity level is now represented by a little tamagotchi-like face rather than the fitbit flower. I miss the flower – I find it easier to interpret. Display-wise, the Zip display is more clear than the old Fitbit Classic. I still can’t comment on how it looks compared to it’s contemporary, the Fitbit One because I haven’t got one of those devices. Synchronizing the Zip requires more intervention on my part than I had anticipated. I’ve never found it to synch to my phone in the background – I usually have to remember to open the Fitbit App, which then triggers a synch event. Unfortunately, since the Fitbit app doesn’t really have any sort of gaming element to it, it doesn’t lure me into opening it regularly – especially since I don’t use it to track my food intake (I use either the Weight Watchers app or My Fitness Pal – depending on whether or not I’m paid up on my e-tools for Weight Watchers). Synching the Zip to my computer is supposed to happen wirelessly and in the background, however it seems my old classic Fitbit is more reliable in doing this. While I have the appropriate software running in the background and the receiver connected, it seems my Zip requires prompting to synch while I’m sitting at my computer, which is a bit of a shame – I was hoping for regular updates all happening in the background without any intervention on my part – so far, no matter what platform I’m using to synchronize, I have to initiate the synchronization manually…which is rather a bummer since I got the zip so that it would sync with my phone and I wouldn’t have to think about going by my computer that has the base station attached like I did with my old Fitbit Classic. The Fitbit App itself is very simple in design. It does not offer near the level of graphs that are presented on the main Fitbit website (though it seems a bit better (to me anyhow) than what is available via the mobile fitbit website). Rather than providing the detailed graph illustrating the day so far, the mobile app provides a daily bar chart illustrating your progress towards your goal in a horizontal fuel-bar-like graph. 1) Battery Life: Not sure how long the coin battery will last in my Zip – it’s still registering as having high charge after having had it for a couple weeks. Replacement batteries for the Zip can be found at most drugstores, and could also be ordered online for cheaper if planning ahead. 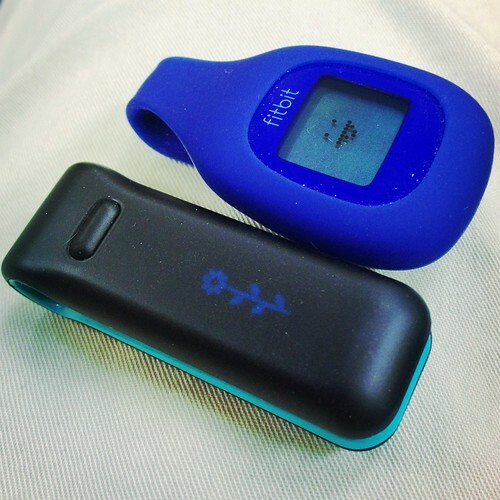 The classic fitbit is rechargeable, as is it’s current incarnation, the One. 2) Display: The Fitbit Zip is very easy to read, though because it is not backlit it is difficult to read in dim light and cannot be checked in the dark. 3) Accuracy of Step Count: Accurate enough. 4) Accuracy of Stair Count: N/A neither my classic Fitbit nor the Zip counts stairs. 5) Accuracy of distance Traveled: Distance Traveled is an estimate based on calculations done by the fitbit devices. The Fitbit seems to use a fairly straightforward #steps x step length calculation. I haven’t had a chance to carry them both on a pre-determined route to benchmark the accuracy. 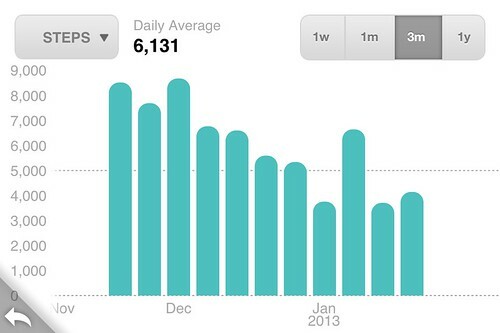 6) Data and Graphs: the Fitbit web dashboard wins as far as a data output standpoint. The app is okay, but does not provide the level of detail that the web dashboard does. 7) Synchronizing: My Classic Fitbit synchronizes more reliably without interaction from me. The Zip synchronizes wirelessly, though it seems I have to prompt it either via my phone or via the computer that has the receiver connected. I’ve got a question open on the Fitbit Forum asking if this is how it’s supposed to work, as this does not seem like an improvement over the original device. 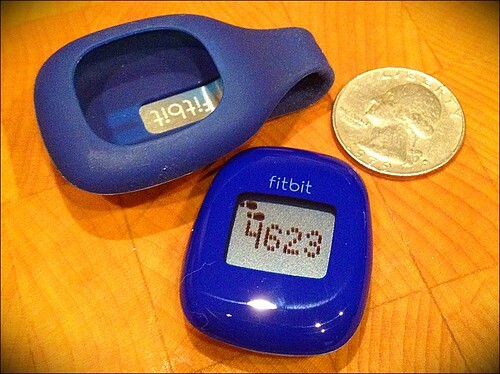 8) Motivators: Fitbit offer Badges for milestones. I haven’t really utilized the friends feature of Fitbit, so I can’t really comment on the social or competition aspects of the device. I’ve linked my fitbit to EarnedIt as well as Everymove so I can earn money for charities or towards rewards by using my Fitbit. Sadly the Fitbit does not really prompt me to get out of my chair or post challenges to try to get me more active, so its really up to me to mentally set up those challenges or prompts for myself. 9) Price: Fitbit One (current model as of this writing) retails for $99.95. Fitbit Zip (does not track stairs, uses a replaceable watch battery rather than being a rechargable device) retails at $59.95. It seems my zip is now synchronizing with no issues. Not sure what was causing the problems before, but I have since rebooted my computer a couple times and the Zip is synchronizing with my computer smoothly and without prompting. I still have not observed any background synchronizing via my phone without opening the app though. After about 6 months of faithful service, the Zip requires a new battery – this is about in line with the the website claims for battery life. My fitbit Classic died a while back, and I wound up replacing it with a Fitbit One at a discounted rate via Fitbit.com. Since I can only have one fitbit device linked to my fitbit account, I was not closely monitoring the battery life indicator on my zip, so I discovered its battery was dead when I noticed it was no longer making faces at me when I put it on my nightstand for the evening. 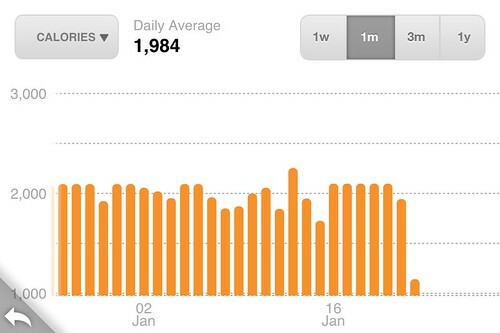 My Fitbit Zip seems to sync pretty regularly on its own without intervention to a laptop. My co-worker in the next cube to mine has a Fitbit One and keeps her dongle in her work laptop during the day, which unexpectdly acts like a little Fitbit hotspot, transmitting my data as well without any setup on my part. I have an Android phone, not iPhone, so I am relaiant on a PC to sync. I agree with you about the phone app, I also find it lacking. I like the Tamagotchi-like faces! 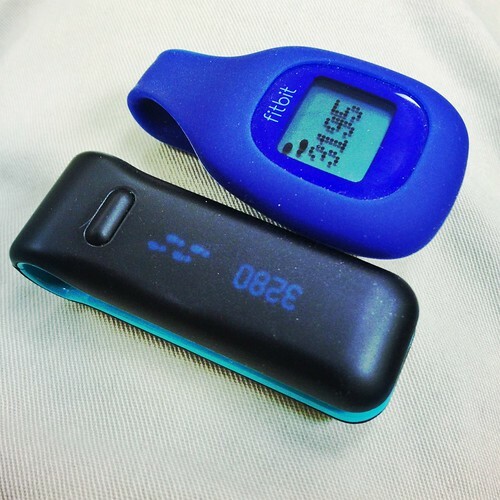 I found that the device registers my movements differently depending on where I wear it. I was clipping it to my bra, but after visiting with my friend Roger (who has a One) and seeing how many more steps that his registered when we were toghether all day, I experimented with other spots. The closest measurement to his came from clipping it on my underwear at hip level in the front and off to one side a bit. 🙂 I tend to carry mine in my pocket, and don’t tend to clip it onto clothing because it’s so grabby and the clip is really tight. I rebooted my machine at home, and I found it synched itself last night though I didn’t register how long I had been sitting at my computer before it did the synch. I’ll have to keep an eye on it!